I find most of the discussion around the term “reverse racism” troubling. Partly for the obvious reason that some people still think such a thing exists, but also because the usual line of reasoning given to disprove it is frustratingly counterproductive. The problem, I believe, lies in the definitions of racism, and particularly the tension between its original, commonplace definition and a newer, evolving definition. The prevailing counter-argument to the concept of reverse racism is usually given thus: Racism is prejudice + power; in other words, it is an institutionalized form of discrimination deeply embedded in a society that provides one racial group with the power to act out their prejudice through systematic oppression of other racial groups. This system can’t be “reversed”, because the oppressed groups do not have enough power and influence to act against the dominant group in any significant way. A: That person of colour used a slur against whites. Reverse racism! B: No, reverse racism doesn’t exist, because racism is prejudice + power, so people of colour can’t be racist. In my unofficial survey of several free online dictionaries (including Merriam-Webster, Cambridge and Oxford) the primary – if not the only – definitions given revolve around racism as a belief in the superiority of a particular race; a feeling of hatred or intolerance for other races; or acts of discrimination or violence against other races. Sadly, of course, it is clear that these xenophobic tendencies are intrinsic to human beings of all varieties. It is my impression that the primary dictionary definitions of the word “racism” reflect its primary usage in common speech as well. Only two of the six sources I checked (dictionary.com and yourdictionary.com) even included any mention of the “institutionalized discrimination” definition. The fact that both of these are uniquely online sources rather than inveterate standbys like Merriam-Webster would indicate that this a newer definition — one that I believe probably evolved precisely to explain why “reverse racism” can’t exist. But any student of linguistics will tell you that people are very, very resistant to language change, especially language change that seems “forced”, and especially especially language change that involves creating a polysemous definition for a word already in common circulation. And understandably so; the potential for confusion is enormous. This is why I say that attempting to use a newer, restricted definition of the word “racism” in order to oppose the concept of “reverse racism” is counterproductive. People will confuse it with the older definition and look at you like you’re a space alien when you try to tell them that people of colour are incapable of racism — because while you mean institutional racism, they think you mean commonplace racism — and will thereby dismiss you as a delusional, raving Social Justice Warrior. Not being personally acquainted with Ms. Peterson, I can’t comment on whether she happens to hold any lowercase-r racist views. But a black woman who posts a photo making fun of a group of people who hold long-established social power and influence over her is not enacting Racism. She is not disparaging white males for the simple fact of being white and male; she is disparaging those white males who continue to propagate systematic prejudice against her for the simple fact of being black and female. She does not have a godlike capability to “reverse” centuries-old paradigms of oppression with one Instagram photo. If only. In they place they call little bighorn. When we rode from Fort Lincoln that morning. But we loved the idea of Americay. Of those that have chosen and empire. That Paddy he died for the union. The song is Mic Ryan’s Lament. I omitted the chorus that didn’t really further the story for our purposes. It’s a story of two brothers from Ireland during the famine fleeing their native home and the oppressors of their people to come to America only to have themselves become the oppressors. The point being that hatred, greed and fear are alive and well, always waiting at the door to usurp a righteous cause (and there is no more righteous cause than equality for all). Heroes such as Ghandi and Martin Luther King Jr. had it right concerning how to prosecute a war on inequality. They taught us to fight but with non-violence, and even with respect in our hearts for those that disrespect us. I had similar experiences to you when I lived for a few years in an impoverished suburb of Phoenix from ages 9-14. I was not only one of the few white kids in school, but also very tall (literally sticking out in the crowd) and very shy, a prime target. Though I was old enough to understand on some level the social context behind the bullying, all I could feel was that I hated myself and was ashamed of my skin. But even then, I was aware that the “power” those kids wielded over me (higher social status within the very narrow context of our school’s student population) was nothing in the face of the much greater power that people like me wielded over them pretty much anywhere else – the mostly white teachers and administrators of the school, the police and judicial system outside of the school, the government at wider and wider levels. And I was aware that I could benefit from this power structure if I had to – teachers would listen to me and believe me (even the Latin@ teachers gave greater leniency to white students); I came from a background of higher literacy and education that allowed me to succeed better in school than most of my peers; adults in my community would go out of their way to help me if they saw that I was in trouble. You’re very right that when any group of people is given power, the tendency is to abuse it. And I think this is what terrifies a lot of white people in the Western world. We have treated other groups so badly for so long that we fear the inevitable retaliation. This is one reason why the backlash against Maya Peterson is so completely out of proportion to what she did – when you have the power to hold someone down, and that power begins to shift, you hold them down even harder. That being said, it ignores racism between groups of people who are not white. For instance, an ethnic Indian or Chinese person might be marginalized in Europe, but I can attest that I’ve seen these same people treat ethnic Africans (for example) with what can only be called racism. In fact, in India and China (where I’ve lived for several years) the prejudice against black people is even more open than the US. These countries may not have a history of slavery, but in practical terms for immigrants trying to make a living there today, the discrimination faced is just as bad regardless. Again, some countries that are or have been insular for a long time (China and Thailand from experience) will also subtly discriminate against ethnic immigrants (including white people). The post also ignores different groups of ‘black people’ being racist to each other in Africa, and in countries where they immigrate. – depending on where you live and immigration patterns, some ‘minorities’ are affluent and some are severely disadvantaged. Racism in this context can go ignored. There are also problems when the minority is in fact in power, and the voice of the majority is not heard. I’ll provide a mildly silly but terrifying example: the University of Toronto Students Union executive recently recommended that they restructure their board of directors to give greater representation to minorities in the community: a women’s director, an LGBTQ director, a disabled students director, a racialized students director etc. This sounds great on paper, but apparently the executive feels no need for a general director, or any position that can actually represent a ‘upper-year straight white male’ – and there are undeniably enough of them on campus to deserve a vote. There are definitely problems with downplaying racism even when it’s not perpetrated by white people or whoever controls institutions. TLDR; you don’t have to be white to be in a position of power, and anyone in a position of power can be racist. However, I do agree with your point about the power structures propping up the racist person. If someone who comments against you has no authority to actually enforce any kind of discrimination, then you need to check your own privilege. Yes, I wrote this from a North American perspective and perhaps should have made that more explicit, but I’m not sure why you say that this post ignores racism between groups of people who are not white? Certainly in other parts of the world there are different ethnic groups who hold the kind of institutional power and influence over other races that would fit the newer definition of capital-R Racism that I’ve described, but I don’t think I said anything that would contradict that. I even made a point of making it clear that I understand that anyone can be lowercase-r racist, regardless of their own skin colour, and I said in the very comment above yours that “when any group of people is given power, the tendency is to abuse it”. Obviously the combination of racial prejudice and political power exists in different paradigms outside of North America and Europe. I’ve mentioned in previous posts that I live in Canada, so I suppose I assumed most of my readers would be aware that I was writing from that perspective. As for the situation at the University of Toronto (an institution whose racial politics I‘m familiar with as it is my alma mater), although I find Munib Sajjad’s comment that you quoted to be inappropriately inflammatory for a student body president, I’d ask you to consider the position that you seem to be taking – essentially, that the representatives of marginalized communities who have been elected to the board of directors are incapable of effectively responding to the needs of straight white male students. For decades, it has been assumed that straight white males are the most suitable candidates to respond to the needs of all students, including marginalized groups; until recent years there has rarely been any question of suitability or impartiality, because SWM are generally seen as neutral. It is only when minority groups begin to gain visibility in positions of power that questions of impartiality arise. Why is it acceptable for a SWM to be put in charge of representing marginalized students, but not the contrary? Furthermore, although this particular student body may not quantitatively reflect the University’s population, the institution itself, as well as the wider society, is still one that was designed with the best interests of the SWM demographic in mind. For this reason I would argue that it is more important for marginalized students to be given representation on this board of directors, even if that means there is no room for a straight white male representative. Thank you for being one of the only people who is pointing out how this debate about the definition of the word ‘racism’ is damaging by itself. I have literally been discussing and researching this topic for over a year and have yet to figure out any tangible reason that people are arguing so adamantly for the ‘race power + prejudice = racism’ definition besides that people want to abolish the idea of ‘reverse racism,’ like you said. All positive attributes of the definition aside, it just leads to confusion and arguments… and it is super easy to be specific with words and phrases to accurately describe what one is getting at if they really need to. Do you need to describe police brutality, prisons for profit and racially zoned housing? You can call that ‘systemic racism.’ Do you need to describe the overarching system of and history of our country that has benefitted white people? You can call that ‘white supremacy.’ But more than that, I think the reason it is never going to really change is has to do with pure linguistics, as you mention… and might I say I commend you for this, because I have never once seen a single person advocating for the sociologically amended definition that ever once even MENTIONED the concept of linguistics. The undeniable truth is that the word itself is multi-faceted and not specific enough to apply all these additional rules to it. It is simply ‘race’ (which could mean any race) and ‘ism’. It does not specify by whom the ‘ism’ is coming from and which group it is used against. ‘Sexism’ is more convincing in terms of it only applying to women because it is reduced to a binary of the two ‘sexes’, in which it is generally accepted that females are receiving the short end of the stick. However, even ‘sexism’ is contentious in this way and there are certain people that argue that females could theoretically be sexist towards men… that the usage of the words ‘Misogyny’ and ‘Misandry’ are better because they are more specified. I dunno… point being that it seems like you understand the whole playing field pretty well and you are not making your point under any short sighted agenda of simply defending yourself as a white person. Rather, that you see this entire subject as counter productive to advancing racial consciousness because it is an unnecessary argument. Sadly, so many people will probably just look at your picture, see that you are white and dismiss this, which is maybe why there are so few comments here. I guess I will leave it at that. Oh yeah, and I think the reason that the woman’s ‘bro’ imitation is not considered ‘racist’ is that white culture in our country is too vast to be defined by stereotypes in any sort of easy way. 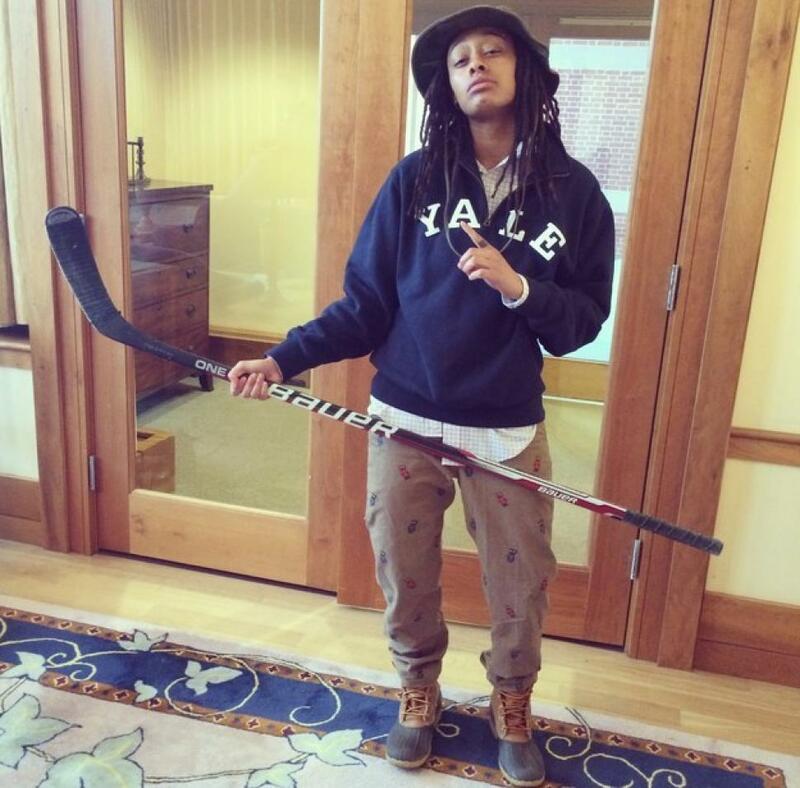 I fail to believe that holding a hockey stick is really a ‘white stereotype’ because people don’t have a fierce association that white people ONLY play hockey; certainly not the way people associate black people with basketball or whatever. There are a FEW certain stereotypes that have developed about white people like ‘white guys can’t dance,’ or ‘white people like mayo’… bur they still aren’t particularly offensive because the power structures that people talk about deny these stereotypes much ability to hurt people; we all know there are plenty of white people who can dance because ballet and stuff is something ingrained into american culture that we have learned about since being very small… and who really cares if white people like mayo? But are these stereotypes ‘racist’? Sure – why wouldn’t they be? Just because these stereotypes don’t actually hurt white people much doesn’t mean they aren’t ‘racist’. However, it should be kept in mind that when one group feels justified in holding onto stereotypes about another, it is inviting the other group to hold onto stereotypes about them; nobody likes double standards… even if holding onto stereotypes about dominant culture can be very helpful for oppressed groups’ sanity. why not just use the term institutional racism when referring to institutional racism and the term racism when referring to the belief that all members of any race possess characteristics or abilities specific to that race, especially so as to distinguish it as inferior or superior to another race or races. prejudice, discrimination, or antagonism directed against someone of a different race based on the belief that one’s own race is superior. then it will be back to obvious and everyone can understand the difference between individual hate, and large scale oppression based entirely on a persons race, not by an entire persons race. To say that POC can’t be Racist may be true in most of America, but the context of the environment is what matters here. Institutional discrimination against the Other can occur within a predominantly black recording studio, a Korean church, or a Hispanic community center. And of course, let us remind ourselves a whole world exists outside of America — countries of other races whose power dynamics differ from our own. The suggestion that ONLY white people can be racist not only *feels* wrong, it *is* wrong, when you apply the definition without a myopic, America-only point of view. I addressed the point about different countries in another comment above. As for your other point, I disagree that *institutional* discrimination can occur much below country-level. Recording studios, churches and community centres don’t have organized security forces to uphold their status quo, or far-reaching social systems that give their members better opportunities for employment, education, etc. An individual who feels discriminated against in such an environment can easily leave and choose to avoid encountering the problem again. This contrasts very sharply with the case of racial minority groups living in a given country.